The United Nations declared last Thursday that 2017 was the hottest year without an El Niño (i.e. an invasion of warm water into the Pacific ocean’s surface, off the coast of Peru and Ecuador, every 4 to 7 years; and usually affects both local and regional climate). The UN report was based on a consolidated analysis by the World Meteorological Organization (WMO) of five leading international datasets. 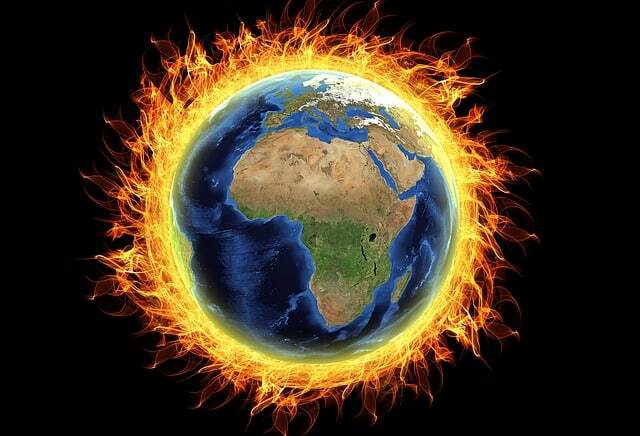 It was said that of all the 18 hottest years experienced in the world, 17 of them were experienced this century. This may be attributed to the rising industrial civilization and the accompanying emission of greenhouse gases. The average surface Temperature of the Earth due to these gases last year was about 1.1°C more than the usual average surface temperature. This figure is in line with the “1.5°C” barrier placed by the 2015 Paris Climate Agreement, to avoid dangerous climate conditions. President Donald Trump’s administration seems to be a threat to the Paris climate agreement. Seeing he stands for anti-environmental policies: publicly denies climate change and wants to promote the use of fossil fuels in the US, plans to invalidate the Clean Power Plan that limits power plant emissions and intends to withdraw the U.S. from the landmark climate accord. On a normal scale, Earth’s global surface temperatures in 2017 ranked as the second warmest, since it became possible to have global estimates in 1880, according to a Nasa analysis. Global temperatures in 2016 were the highest recorded so far; but this was influenced by El Niño, which is considered the warm phase of El Niño Southern Oscillation. Thus, without an El Niño event in 2016, 2017 would be the warmest year ever recorded, (NASA). While the Earth warmed all over, weather dynamics do affect regional weather patterns. Therefore, various locations experience different amounts of warming. GISS Director, Gavin Schmidt, said to NASA, “Despite colder than average temperatures in any one part of the world, temperatures over the planet as a whole continue the rapid warming trend we’ve seen over the last 40 years.” The Arctic regions (which continued to experience a loss of sea ice in 2017) experience the strongest warming trends in the world, about two times the normal rate. National Oceanic and Atmospheric Administration (NOAA) scientists gathered a separate, independent analysis that shows a strong agreement with NASA’s report. However, the report concluded that 2017 was the third warmest year in their record. NASA (National aeronautics and space administration) and NOAA use different methods to analyze global temperatures, which played a role in the minor difference in rankings. Taalas expressed that the warmth in 2017 was accompanied by extreme weather conditions in many countries around the world. “The United States of America had its most expensive year ever in terms of weather and climate disasters, whilst other countries saw their development slowed or reversed by tropical cyclones, floods and drought,” he said. NOAA noted earlier this month that weather and climate-related disasters cost a whooping $306 billion in 2017. The NOAA agency listed several noteworthy events, including the wildfires in the west, with total costs of $18 billion, tripling the previous U.S. annual wildfire cost record. This year, the string of devastating hurricanes were also very expensive. Hurricane Harvey costs about $125 billion. Hurricanes Maria and Irma had total costs of $90 billion and $50 billion, respectively. NASA scientists use measurements from 6,300 weather stations to track global temperatures. These stations include — Antarctic research stations; and ship- and buoy-based observations of sea-surface temperatures. These raw measurements are analyzed using an algorithm that considers interference that could skew the conclusions. The global average temperature is deduced from these calculations, from deviations from the baseline period of 1951 to 1980, according to NASA. As weather stations keep changing locations, and methods of measurement keep evolving, there are uncertainties in the specific annual interpretations of the global mean temperature. Therefore, NASA estimates that 2017’s global mean temperature change is accurate within 0.1°F, with a 95 percent confidence level. NASA is the agency that sets the 2017 temperature data and the complete methodology used to make the temperature calculations. Hence, the report obtained from them as to 2017 being the hottest year without an El Niño, is very reliable. The post 2017 was the Hottest Year Without an El Niño : UN appeared first on Conserve Energy Future.